Christina is an active professional musician who lives in Raleigh. She has been playing trombone since 1992, and holds a Bachelor of Music degree from East Carolina University and a Master of Music degree from the University of North Carolina at Greensboro. Sharing music with young people is the cornerstone of Christina's career. Christina has taught thousands of people the joy of making music, while on tour, in schools, and in private lessons. Christina's teaching approach is centered on building good habits and having fun! Students learn to use critical thinking and good practice skills to overcome problems in their playing, and develop ways to better understand both their instruments and themselves. At Wiley, Christina focuses on helping Beginning students lay a solid foundation of practice and teamwork that they can build upon throughout their musical lives. 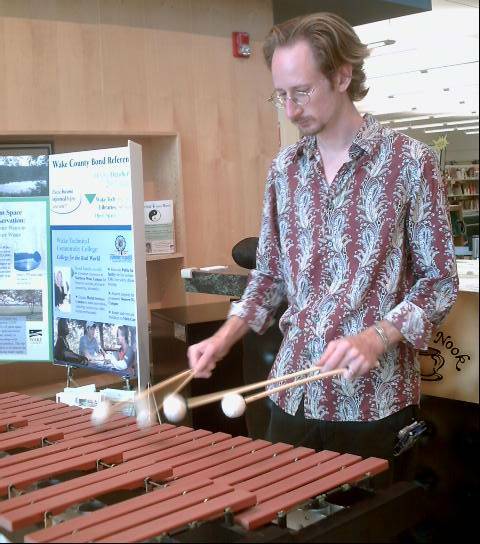 Andrew Munger is a music educator, composer, and multi-percussion artist living in Raleigh, NC. Since earning his Artist's Diploma from the Atlanta Institute of Music in 1993, Andrew has done extensive work with symphonic percussion, West African percussion, drumset, mallet instruments, and electronic media. He currently serves as Principal Percussionist with the Raleigh Symphony. Andrew understands the far-reaching benefits of music education, and is committed to sharing his musical expertise with students of all ages. At Wiley, Andrew's focus is on helping the Continuing Band develop strong technique, expressive playing skills, and confidence with challenging band literature.